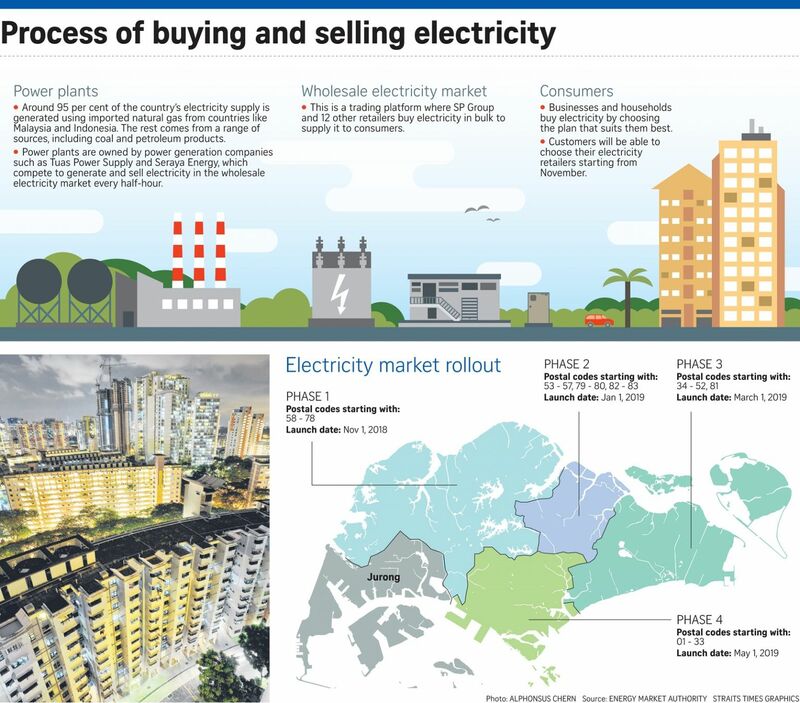 From November, the energy market will be steadily liberalised across the island, culminating in 1.4 million more Singapore households and businesses being able to choose their electricity supply from 12 more retailers. The Open Electricity Market, which will cover the entire country by May next year, could see consumers save around 20 per cent or even more on their electricity bills. The launch of the open market was announced yesterday by the Energy Market Authority (EMA), with Minister for Trade and Industry Chan Chun Sing saying that the rest of Singapore is now ready for liberalisation after a positive pilot in Jurong which kicked off in April. "We have done this carefully and progressively, and have collated our experiences to make sure that when we roll out the market to the rest of the country, we will face the least problems," he said. The open market will be rolled out progressively in four phases over six months. 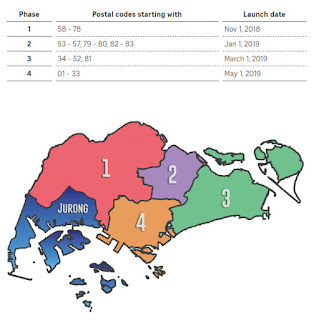 Areas with postal codes which begin with 58 to 78 will join the open market on Nov 1. These include parts of Clementi, Bukit Batok and Upper Thomson. Areas with postal codes starting with 53 to 57, 79 and 80, and 82 and 83, will be next on Jan 1; followed by 34 to 52, and 81, on March 1; then those from 01 to 33 on May 1. The 12 retailers include those which generate power, such as Senoko Energy, and resellers such as Ohm Energy. EMA director for market development and surveillance Dorcas Tan said the progressive roll-out was to allow retailers and the authorities to focus their resources and better fix teething issues. Feedback from the Jurong pilot, which involved 108,000 households and 9,500 businesses, helped EMA fine-tune its plan. The option of differentiated pricing for peak and off-peak periods will not be offered as it was picked by less than 1 per cent of those who decided to go with a new electricity supplier. What stood out from the pilot, however, was how more than 30 per cent of eligible Jurong accounts switched their electricity retailers. Take-up rates in other parts of the world tended to be in the single digits, said EMA chief executive Ngiam Shih Chun. "Those who switched paid an electricity rate which was on average about 20 per cent lower than the regulated tariff," he added. "We now hope to bring the benefits of competitive pricing and innovative offers to the rest of Singapore." He stressed that households can choose to stay with SP Group, which manages the national grid and sells electricity at a regulated tariff which is reviewed every quarter. Sales manager Marcos Ong, 26, who lives in a three-room Jurong flat with his wife and younger brother, said: "I have seen savings of up to 25 per cent off my monthly electricity bill since switching to Keppel Electric." Four retailers who took part in the Jurong pilot - Diamond Electric, Red Dot Power, Sun Electric and Sunseap - will not be part of the nationwide launch for varying reasons. They will continue honouring the contracts to the 500 or so accounts they now have in Jurong, and will be able to join the open electricity market at a later point. • Read the notification package and information booklet that you will receive before the roll-out comes to your neighbourhood. • Contact your preferred retailer for details on the price plan, and read through the contract carefully. • Sign up with the preferred retailer, who will work with SP Group to make the switch for you. Your contract will start as early as five business days after your retailer informs SP Group about making the switch. Customers here will be able to choose their electricity retailers starting from November, in an expansion of the open electricity market that launched in Jurong this April. Q HOW DO I KNOW THAT MY RIGHTS AS A CONSUMER ARE PROTECTED? A The Energy Market Authority (EMA) has created a consumer advisory, and all retailers must make sure you acknowledge the document before they proceed with the switch. Retailers also need to safeguard each account's security deposit. If retailers fail to comply with the terms of their licence with EMA, they can be suspended or have their licence taken away. You can also approach the Consumers Association of Singapore in case of a dispute with a retailer. Q WILL I BE DELUGED WITH MARKETING CALLS? A Retailers are banned from door-to-door marketing and from giving unsolicited calls or messages to residents. For greater assurance, you can register with the Do Not Call Registry. Q HOW IS IT POSSIBLE FOR RETAILERS TO CHARGE LOWER RATES? A The regulated tariff reflects the long-term costs of producing electricity in the market (including fuel costs), while the retailers' rates reflect the short-term costs that depend on current market conditions and the varying levels of competition. An analogy is property. The price one pays for property is typically stable across the loan period, while the market rate for renting out the same property will depend on the demand and supply in the housing market. Q WILL SWITCHING ALWAYS LEAD TO LOWER BILLS? A It depends. The factors which determine how retailers set their rates (for example, electricity demand and supply levels, and the fierceness of competition) may vary over time. There is no guarantee that the electricity rates they offer will remain at current levels. That said, those who switched retailers in the Jurong pilot paid an electricity rate that was, on average, about 20 per cent lower than the regulated tariff. Q MUST CONSUMERS SUBMIT METER READINGS AFTER SWITCHING? A Only those who wish to be billed based on their actual meter readings every month need to submit meter readings. SP Group will continue to read meters once every two months, so it will estimate the meter readings for billing purposes. Q WILL I HAVE TO CHANGE MY METER IF I SWITCH RETAILER? A No. However, those who wish to install an advanced meter to monitor electricity consumption every 30 minutes may have to pay a one-time installation fee of $42.80, unless their retailer waives the fee. Q WHAT IF A RETAILER SUDDENLY PULLS OUT FROM THE OPEN ELECTRICITY MARKET? A Your electricity supply will not be disrupted. You will continue to receive power through the national grid operated by SP Group. Businesses with an average monthly consumption of at least 4,000 kilowatt hours, however, will buy electricity indirectly from the wholesale electricity market through SP Group at wholesale electricity market prices. Households here will get to explore the range of electricity plans from Nov 1, following an expansion of the open electricity market which was launched in April in Jurong. The nationwide launch will be rolled out progressively in four stages, according to postal codes. When complete, about 1.4 million households and businesses will be able to buy electricity from 12 different retailers in addition to SP Group, the Energy Market Authority (EMA) announced yesterday. The pilot in Jurong saw a high take-up rate, with more than 30 per cent of eligible accounts switching electricity retailer. In comparison, the take-up rate in other parts of the world have been in the single digits. On Nov 1, areas with postal codes which begin with 58 to 78 will join the open market; areas with postal codes starting with 53 to 57, 79 and 80, and 82 and 83, will be next on Jan 1; followed by 34 to 52, and 81, on March 1; then from 01 to 33 on May 1. Households The Straits Times spoke to said they were looking forward to choosing from a host of retailers and picking a price plan that could help them enjoy cost savings. Mr Bobbie Ng, 51, said he may opt for the fixed-price plan when the option becomes available in Tampines from March 1, where he lives. He hopes the new plan will help cushion consumers from any potential price fluctuations. The driver, who lives in a four-room Housing Board flat, currently spends close to $200 per month on electricity bills. Woodlands resident Abdul Salim, 26, prefers to take a wait-and-see approach. "Whenever you have more competition, the prices will be fair." "But there are suddenly so many available retailer options, so I will probably wait and see which ones are more popular with the existing users," added the engineer, who owns a five-room flat. Mr Salim, who will be able to choose from Nov 1 when the option is available in Woodlands, said his electricity bill is usually about $200 a month. With the other 12 retailers, consumers can choose between two standard price plans: A fixed-price, and a discounted rate off the regulated tariff. There are also non-standard plans made available by individual retailers. Some said they would use the opportunity to try various retailers to find one that suits them best. "Since there are so many options, I would probably just switch if I am not satisfied with one of the options after the contract ends," said Ms Sarah Toh, 30, who lives in a five-room flat in Pasir Ris and pays $300 to $350 a month for electricity. Contracts have a lock-in period of six months, 12 months and 24 months. The freelance designer, who will have the option to switch from March 1, maintains that with the electricity market opened up, "it makes for a happier relationship between the users and service providers". "Each user can gauge his or her own needs and choose a retailer that best suits them," she added. She is considering engaging Ohm Energy, which provides carbon-neutral electricity to households. Even though the EMA has clarified that electricity supply in households will not be disrupted if a retailer suddenly pulls out from the open electricity market, some consumers remain concerned. Mr Salim said: "A lot of people might still stick with the status quo (with SP Group). Some may be scared that the retailers might just pack up and suddenly leave, and it might take a few hours for the electricity to be restored." EMA has said that households will continue to receive power through the national grid operated by SP Group. When the Jurong electricity market opened in April, allowing residents to choose their retailer instead of just staying with SP Group, medical officer Qiu Yongyin grabbed the chance to switch. Dr Qiu, 32, is now in a two-year contract with Keppel Electric, which charges him a rate discounted from the regulated tariff. His electricity bill used to be almost $100 a month. Now, it is $70 to $80. His satisfaction with the open electricity market (OEM) echoes that of many customers who took part in a survey by the Energy Market Authority (EMA), the results of which were released last Friday. From a representative survey of 400 Jurong residents who switched retailers, the EMA found that about 80 per cent of them had a positive impression of the OEM. Last Friday, the EMA announced that the entire electricity market would open for the whole country in phases, starting from November. Dr Qiu, who lives with his wife, son and helper at a condominium in Jurong Lake Link, said: "I don't have any concerns about the OEM as I know that there are measures in place to protect my interests, and the reliability of my electricity supply is ensured." IT engineer Wang Zhili also has no regrets about switching to Ohm Energy in April. He said: "I definitely did it to save money. Whatever we earn, we need to spend wisely." The 30-year-old signed a two-year fixed-price contract and has seen his bills drop from $100 a month to around $70. He chose Ohm Energy because it made the switching process hassle-free, although he has since moved to Bukit Batok, whose electricity market will liberalise only in November, when he expects a "price war". However, not everyone has had a seamless transition. Lakeside Drive resident Casey Ong signed a two-year contract with Senoko Energy and had to set up a new Giro payment plan, which he found slightly inconvenient. But he now pays $100 a month for power for his household of four, $50 less than previously. However, out of the 108,000 households and 9,500 businesses in Jurong that could choose different retailers, only about 30 per cent have switched in six months. Housewife Evelyn Tan, 68, is among the seven in 10 who decided to stay with SP Group, which manages the national grid and sells electricity at a regulated tariff that is reviewed every quarter. "Our electricity bills have been very stable all these years," said Ms Tan, who lives with her son in a condominium and pays between $90 and $100 a month. Even the nationwide launch of the OEM will not convince her to switch. "It's still very new, and these retailers are typical salespeople who will talk to you and try to tempt you with benefits during roadshows and events like that," she said. "I'm happy with the service that SP Group has provided, so let's wait and see." Jurong GRC MP Ang Wei Neng said his residents talk to him about the OEM around twice a week. He has handled only two cases of consumers who wanted to go back to SP Group, with most of those who have changed retailers being happy with their decision. Those yet to change claim that the process is troublesome and there are too many retailers to choose from, although Mr Ang stresses to them that it is quite hassle-free. "In the past one or two months, in almost all my community event speeches, I encourage them to take part in the OEM," he said. "Jurong residents are fortunate in this pilot project because the benefits given by the power companies are quite generous, and I'm not sure if this generosity can be extended to the whole of Singapore. "So the residents should exploit this advantage." 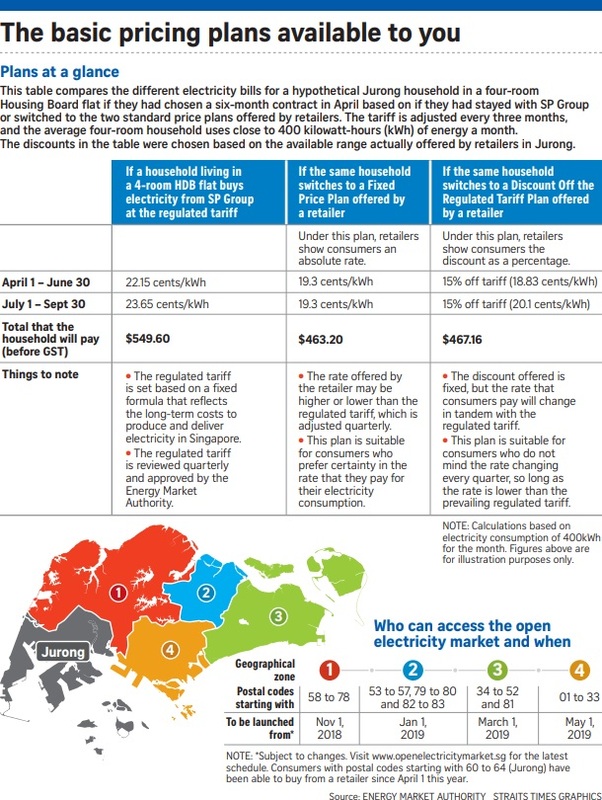 From free iPads to free Internet subscriptions, the open electricity market kicks off in the northern part of Singapore today amid fierce competition, with retailers dangling myriad deals to persuade consumers to sign with them. All 350,000 households and firms in areas with postal codes starting with 58 to 78 - such as Woodlands, Yew Tee and Bukit Gombak - will be able to switch from SP Group starting today, marking the first phase of the nationwide roll-out of the open market. It will cover the entire country by May. The list of retailers now includes Sunseap Energy and Diamond Energy Merchants, while SingNet has pulled out, bringing the total number of firms to 13. To make themselves more attractive to customers, some have thrown in freebies or have partnered with companies in other industries to offer unique packages. iSwitch, for instance, will give customers a complimentary iPad if they sign up for its iPromo price plan. Its spokesman said: "We learnt a lot from the Jurong launch and realised that customers don't only look for affordable price plans. They tend to favour more value-added products." Keppel Electric is also strengthening its partnership with telco M1 to offer customers deals that include free Internet subscriptions. A soft launch seven months ago in Jurong allowed the Energy Market Authority (EMA) to fine-tune the initiative. For instance, retailers must now offer at least one of two standard plans - a fixed price plan or one with a discount off the regulated tariff. Previously, one of the standard price plans involved differentiated pricing for peak and off-peak periods. Those customers who do not wish to switch retailers can stick with SP Group, which manages the national grid and sells electricity at a regulated tariff that is reviewed every quarter. An EMA spokesman said: "With the open electricity market, we hope to give households more choices and flexibility when buying electricity, while being provided with the same electricity supply through the national power grid." A PacificLight Energy spokesman, revealing that more than 6,000 Jurong customers have switched to its services, said it believes more account holders will switch retailers once they understand that doing so will not impact their electricity reliability. Choa Chu Kang resident Chew Yew Tuan, 61, said he was looking forward to the open electricity market as it would bring better prices through increased competition. The executive project engineer said: "As consumers, we are looking for the cheapest deals. It is very likely that I will switch, but I will let the market run for a while first and see what happens." Retired financial trader Tan Kok See, who also lives in Choa Chu Kang, said he wished that more information had been given to consumers sooner, adding that there are too many retailers to choose from. "Just give me three very solid choices," said Mr Tan, 57, adding that he would have to find out more about the various rates and packages on offer before deciding on whether to switch retailers. However, when asked whether he would change should his final bill end up cheaper, he responded that it would be a "no-brainer". The Energy Market Authority (EMA) is moving closer to finding the cause of Tuesday's massive blackout, said Minister for Trade and Industry Chan Chun Sing. Speaking at the launch of the nationwide open electricity market yesterday, Mr Chan said: "The good news is that EMA, together with the generation companies and the original equipment manufacturer, has been able to quickly zoom in on the source of the problem. "But we are conducting further tests because some of these components are also used by plants in Singapore and in other parts of the world. "So, we are working closely with the original equipment manufacturer to make sure that such things don't get repeated." On Tuesday at 1.18am, 146,797 residential and commercial customers in 19 areas of the country were plunged into darkness for 38 minutes in Singapore's worst blackout in 14 years. Mr Chan said the episode showed Singapore's back-up procedures worked well, because even though both the original and the back-up power-generating units failed, fresh capacity was started 15 minutes afterwards with power gradually restored to the rest of the island. Asked if the responsible power suppliers would face penalties, he said that it was too early to say. "I would like to assure Singaporeans that we have sufficient capacity in our system, and this is what we demonstrated that night - that when the first system failed, the back-up system kicked in immediately. "And even when the second system failed, we had sufficient capacity to start up the power from 15 minutes onwards."